It is Krishna Janmashtami, or the birthday of Lord Krishna tomorrow. 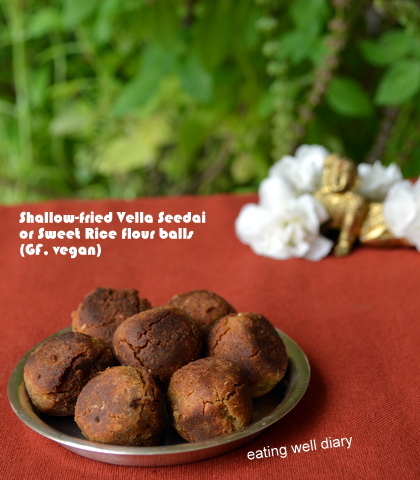 I am here with an easy and healthy way to prepare his favorite sweet rice flour balls, shallow-fried with just a Paniyaram or Aebleskiver pan. Yes, and no compromise in taste! It is advisable to use only oils with a high smoke point for frying purposes. 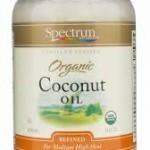 Coconut oil is my first choice, especially Refined Coconut oil with a smoke point of 500 °F. Today I did a dry run of sweet seedai preparation and I’m very happy with the results! I used a cast-iron Appe/ Aebleskiver/Paniyaram pan. 1. 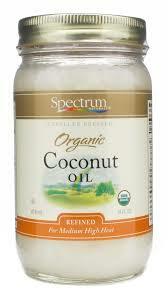 Have you tried deep frying with coconut oil? It froths up like crazy! Shallow frying solves that problem. 2. You can control the amount of oil that every seedai takes . 3. While deep frying the sweet seedai sometimes pops and all the flour gets spread in the oil. A total mess. This individual frying process makes it much easier to handle. 4. There is no remaining oil in the end. No reusing frying oil anymore. Yay! 1. Roast the Urad flour till it turns brown. 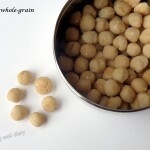 If the Urad flour is prepared by grinding roasted Ural dal, skip this step. 2. 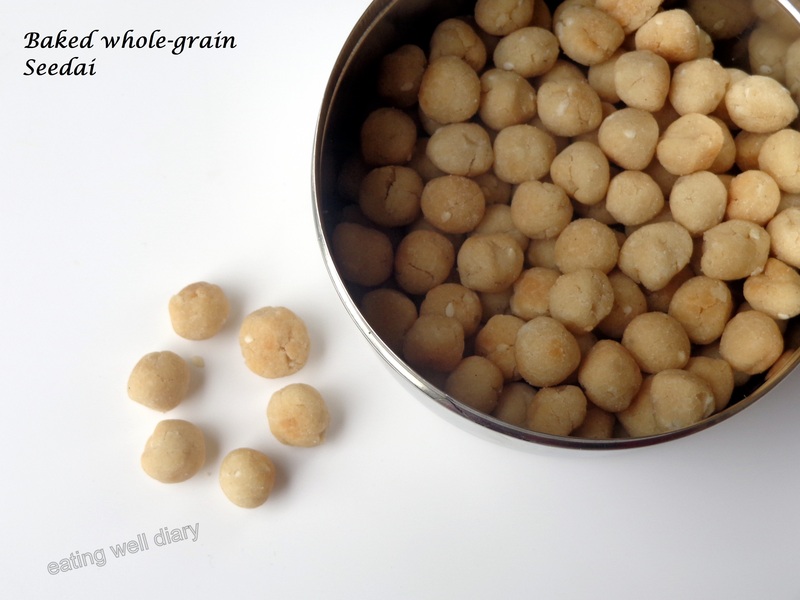 Slightly dry roast the rice flour in a pan and combine with urad flour. Add sesame seeds and coconut slices to it. Mix well. 3. Melt jaggery in a pot with 1/4 cup water. 4. Filter the jaggery solution to remove impurities. Add cardamom powder to it. 5. 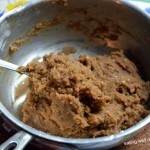 To the jaggery mixture, add the flour mixture and mix to form a firm dough. 6. With oiled hands, knead into small balls and keep ready for frying. 6. 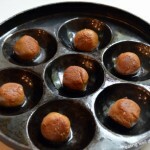 Heat the Paniyaram pan and add 1/2 tsp oil to each pocket. 7. Place a ball in each pocket. When the bottom turns into a deep brown color, use a spoon to turn it over. 8. Add more oil and allow to fry. Make sure to pour oil into the cracks that develop so that the inside is cooked well. 9. 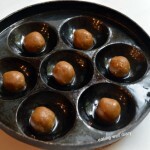 Ensure that the balls are done on all sides before taking them out and place on a paper towel to absorb excess oil. 10. Wait for the seedai to cool completely before storing in an airtight box. 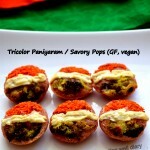 Happy Janmashtami and I hope that you try this easy recipe! I promise that you will not be disappointed. Do let me know how it turns out. 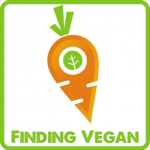 Sharing this at the Vegan Potluck Linky #101 at Urban Naturale. Good idea to get it shallow fried…. great yum delicious recipe. Plz visit my blog too and share your valuable comments. Thank you . MMMMMMM! 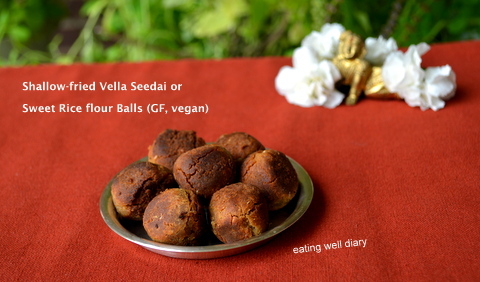 These balls look so delectable! Ooo these look interesting. 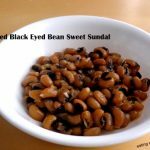 I have urid dal but not flour – how would I roast it for use in this? Thanks for sharing at the Plant Based Potluck. Thank you for your comment! The urad dal can be dry roasted and ground into a fine powder using a good spice grinder.